Reliance Jio on Thursday introduced cashback offers of up to Rs 2,599 for all Jio Prime customers. The upcoming cashback offer will be provided for all recharges of Rs. 399 and above. The offer goes live on November 10 and will be available until November 25. The cashback offer from Reliance Jio includes 100% cashback in the form of eight vouchers worth Rs. 400 on every Jio tariff recharge of Rs. 399 or above. While the company has also partnered with popular wallets to provide instant cashback of up to Rs. 300 on every recharge done through mobile wallets including Amazon Pay, AxisPay, FreeCharge, MobiKwik, Paytm and PhonePe. Additionally, Reliance Jio has also partnered with some e-commerce sites to provide vouchers of up to Rs. 1899 on every recharge. Under the Jio triple cashback offer, subscribers who recharge with Rs. 399 and above from MyJio app or Jio.com site will get Rs. 400 cashback in the form of eight vouchers of Rs. 50 each. These vouchers can be used while purchasing future recharge packs. Thus, total eight vouches will sum up to Rs. 400. There are also more benefits for wallet users. Further, if you recharge using digital wallets, you will get instant cashback up to Rs. 300 on every recharge, but the offer differs from wallet to wallet. For example, you will get Rs. 99 as cashback if your recharge through Amazon Pay if you are a new user while existing users will get Rs. 20 cashback. You can check all wallet offers in the image below. Jio offers e-commerce vouchers for AJIO, Yatra and Reliance Trends. AJIO voucher offers Rs 399 off on a minimum purchase of Rs. 1500 at ajio.com. Yatra voucher provides a discount of Rs. 1000 on all domestic flight round trip tickets and Rs 500 off on one-way tickets. Next, Reliance Trends voucher offers an instant discount of Rs 500 for purchases worth Rs 1999 and above at reliancetrends.com. the e-commerce vouchers from Jio will be available from Nov 20. Reliance Jio has also introduced a limited period 100% cashback offer during Diwali last month. 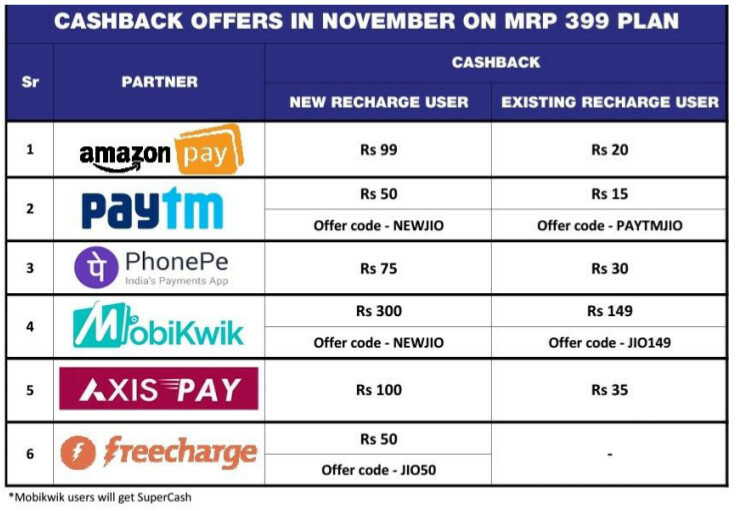 Now, this triple cashback offer is probably announced to retain the user base which might be going down after the recent price hike of Jio plans last month. The cashback and partner offers are limited period offers and it will end on Nov 25 after starting from tomorrow Nov 10.